Folk singer Jimmy Driftwood called the Buffalo River “Arkansas’s gift to the nation—America’s gift to the world.” It was the first national river to be designated in the United States (1972). 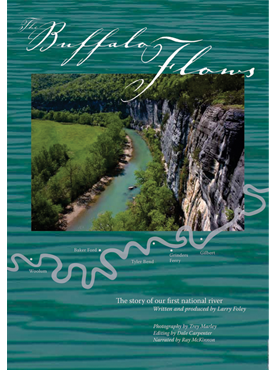 The Buffalo Flows is a one-hour documentary film written and produced by two-time Emmy award–winning filmmaker Larry Foley, professor of journalism at the University of Arkansas. Academy Award winner Ray McKinnon narrates. Internationally known as an outstanding canoe stream, this 135-mile river, free of dams, is so much more, and the film captures what is protected. The film will premiered on AETN in winter 2009. Later in the year it was shown in conjunction with Ken Burns’s “The National Parks: America’s Best Idea.” Bonus features: music video with an original song and “Buffalo River,” a film by Neil Compton, the man who led the fight to save the Buffalo as a free-flowing stream. To view a clip from the film visit the “Buffalo Flows” website. Two University of Arkansas professors captured Emmy Awards October 3rd in St. Louis from the Mid-America chapter of the National Academy of Television Arts and Sciences. Music professor James Greeson won for an Emmy for his musical composition for the documentary film, “The Buffalo Flows.” Journalism professor Larry Foley, who wrote and produced the film, won an Emmy for best writer for a TV program.